The temperature of your water can have a huge effect on your fish, and really means the difference between fish that are happy and healthy and fish that are slow, lethargic, stressed and susceptible to disease. When you first start keeping goldfish there are a few things to take into account. Tank size, food options and filtration. But the most important is the best water for goldfish. 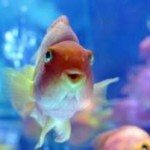 So what’s the best water temperature for goldfish, and in what circumstances might you need to adjust the set temperature? Goldfish water optimal range is 23 to 24 degrees centigrade. Goldfish are often considered to be tropical fish, as they’re certainly not cold water fish, but is this really a true description? While goldfish can live in temperatures as high as 30 degrees centigrade, experts recommend keeping them in water that’s between 23 and 24 degrees. This brings them into the middle ground between being cold water fish and tropical fish. The answer is simple. Goldfish can become stressed in higher temperatures, and yet they draw their energy from the water. They’re powered by it. If you were to look at a fish living in water heated to 15 degrees, and a fish living in water of 25 degrees, you’d notice huge differences. Allowing for similarities in health, age, and size the fish in the warmer water would almost certainly be a faster swimmer, and there would also be a number of advantages you couldn’t physically see, such as better digestion and a stronger immune system for warding off disease. There are times when it might be necessary for owners to raise or lower the water temperature for short periods of time, taking the temperature outside of the optimal range of around 23 to 24 degrees celsius. Of course your goldfish won’t thrive as they would in optimal temperatures, but if they’re kept within the acceptable range they shouldn’t suffer and will quickly adapt to their new environment. Raising or lowering the water temperature for goldfish shouldn’t be undertaken without good reason and solid planning. There are usually only 2 reasons that goldfish water should be heated or cooled. In terms of breeding the reproductive abilities of a goldfish is highly influenced by the environment. The fish follow a seasonal pattern whereby they release more androgen (a reproductive hormone) in the warmer spring temperatures, and less of the hormone in the cooler winter months. An evolutionary pattern that ensures a higher survival rate for larvae in the wild. Fish breeders can find that by mimicking the natural seasonal changes and raising the goldfish water temperature slightly in the spring to around 25 or 26 degrees centigrade, and lowering the temperature to between 10 and 12 degrees in the winter, that their fish breed more easily and produce healthier, hardier larvae. 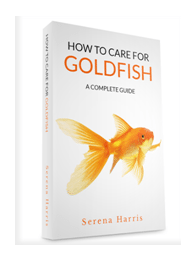 Water for goldfish can sometimes need to be heated or cooled if recommended by a fish vet, or if you’ve reasonably self diagnosed your fish with a specific disease that can be successfully treated through temperature changes. Experts often recommend raising the temperature of goldfish water to around 30 degrees celsius for a period of roughly 10 days if the fish becomes infected with parasites. Click here for more info on treating White Spot by raising water temperature. Unfortunately the most common fish parasites tend to have rather long life spans of between 1 and 2 months on average. While temperatures of 30 degrees aren’t enough to kill the parasites off, it’s enough to significantly reduce their life expectancy, which can speed up the healing of your goldfish and reduce the stress and discomfort for them. Other goldfish diseases can be treated through lowering of the goldfish water temperature, such as herpes virus for example. It’s reported that goldfish diagnosed with herpes virus living in temperatures of between 20 and 25 degrees celsius suffer a 90% mortality rate, while sick goldfish living in 15 degree temperatures have just a 10% mortality rate. It’s important you strive to maintain a constant temperature within the optimal range in order to keep fish happy and healthy. An aquarium thermometer is the best way to ensure accuracy. Remember that your fish may benefit from periodic temperature changes, particularly if they become unwell. Although goldfish can withstand quite a range of temperatures, they’re likely to suffer from stress if their environment is altered too quickly. If you do need to adjust the goldfish water conditions, always plan to do this over a specific time frame, rather than cranking the heat up spontaneously. A good rule of thumb is to adjust the temperature by 1º per hour until the desired temperature has been reached. If you notice that your fish are behaving oddly after a temperature adjustment, don’t panic. Your fish may swim with increased energy, or may move in uncoordinated patterns, both of which are completely normal. You can reduce the extent of the unusual behavior by changing the temperature gradually, and you’ll see that your fish quickly return to normal once they’ve become acclimatized to the new temperature of the water.